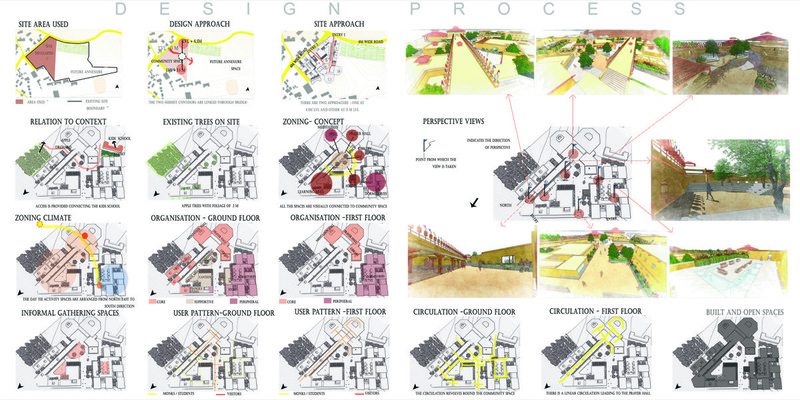 Institute's Name - SCHOOL OF ARCHITCETURE – VADODARA DESIGN ACADEMY. The idea of designing a Bauddha Darshan Centre at Tabo is due to the historical significance of the region as a major learning hub and preserver of many manuscripts of Buddhism. With this proposal, the opportunities for perceiving higher studies in Buddhism, not only for the monks and locals but also for other foreign people can be generated which further leads to the development of the locals as well as the town by exchange of ideas and methods through this centre. An effort is made to promote the importance of local architecture language within the people of Tabo through the use of vernacular materials in order to reflect the local values. 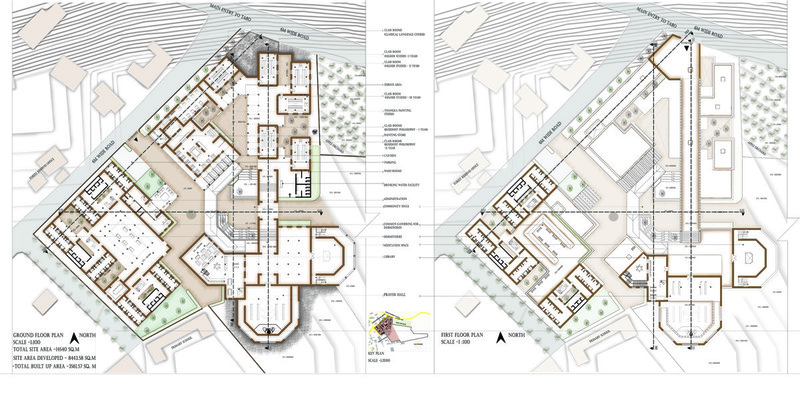 To preserve the local traditions and historic value of Tabo monastery and support the existing cultural values by creating an architectural module for the town that utilises both the modern as well as traditional understandings. To enrich the village of Tabo by developing it as a centre where people not only learn and conduct historic Buddhist research but also become a part of the village where exchange of ideas takes place. Preserve the Traditional Buddhist legacy by providing opportunities to study further. Promote local economy through their own traditions and craft. 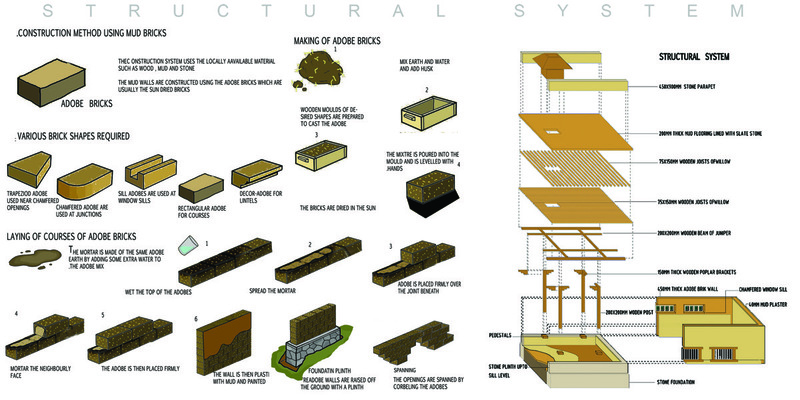 Generate awareness of traditional building know how by creating a module and aspire people to build with their traditional sense and preserve their ecology. Tabo being 1000years old and hosting no.of manuscripts will encourage no.of people for further studies and also create opportunities for locals, if provided with better facilities. By setting up an example of a built module reflecting their own traditions and culture in terms of spaces and materials, will help people understand the socio-culture of that place. The Centre functions as a place where Higher Education in Buddhist Philosophy (referring as Bauddh Darshan) is provided for the Buddhist Monks and also basic understanding of Buddhism, its literature and Languages are taught to lay people for a better understanding of the manuscripts. WHY AN EDUCATIONAL INSTITUTE ALONG WITH MONASTERIES? To provide traditional and modern education to the monks and nuns of the Gonpas. 1) Taking universal responsibility and seeking lasting happiness through imparting the education of Buddhist View of Interdependent origination and non violence practice. 2) Learning modern subjects like economics, mathematics and English language etc. with traditional/cultural education to cope with the time and the society and to produce lots of educated person having combined knowledge of both traditional and modern education. The site is approached from North and West which is 3M below the North Entrance.A pathway(which is the roof of the lecture halls) leading to the main temple, acting as a bridge; with the view of just the temple and mountains as an overpowering background is created. 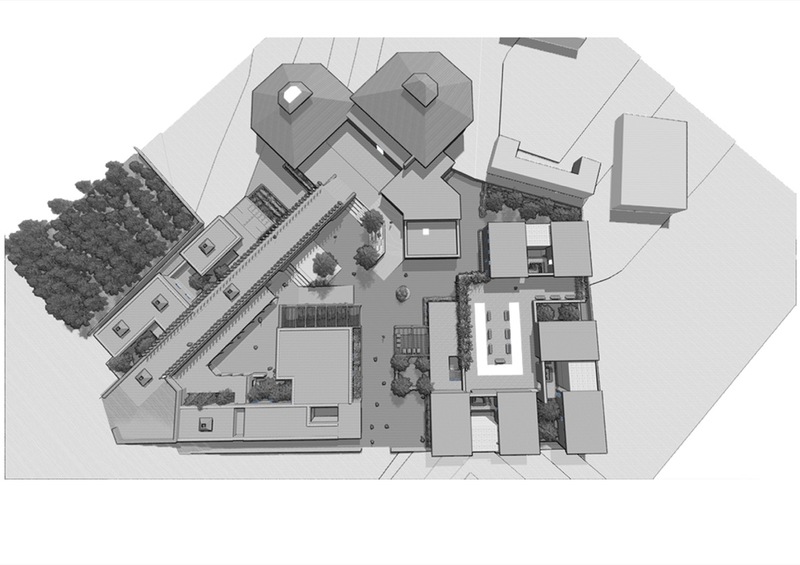 A continuous Ramp is created around the community space connecting the Learning Area i.e, 1M below the ground level, Community Space on ground level and the Pathway (The Roof). A ramp is also created within the prayer hall connecting the Ground and Upper Level. It revolves round the statue of Buddha forming the part of PRADAKSHINA act, where the prayer wheels act as railings.